Vladimir Putin’s apparent willingness to invade bits of land adjoining Mother Russia where he feels native Russian-speakers are feeling oppressed has understandably made many in the immediate neighborhood rather nervous. And while Poland, Lithuania, Latvia and Estonia are all members of NATO, that still doesn’t necessarily allow them to sleep easily at night. The famed Article V of the NATO treaty does make an attack on any one member an attack on them all, which theoretically means that the Alliance’s nuclear powers – the US, foremost – would be willing to escalate all the way to Mutually Assured Destruction should Putin merely have his forces invade the Baltics and then refuse to back down. But how credible is that? For that matter, how effective were France and England in carrying out the guarantees of Poland’s territorial integrity that they issued just prior to the Second World War? Yes, that Baltic nation is shortly to publish a “survival manual” for all its citizens about what to do in case of a Russian invasion! Now, I found out about this via the round-about path that you can see contained in that tweet. But it turns out that, within that Le HuffPost article, there was an additional link to a Reuters article, in English and datelined from the Lithuanian capital Vilnius, that lays everything out pretty well. “The manual, which the Defence Ministry will send to libraries next week and also distribute at army events, says Lithuanians should resist foreign occupation with demonstrations and strikes, “or at least doing your job worse than usual”. “[W]orse than usual” – love that! 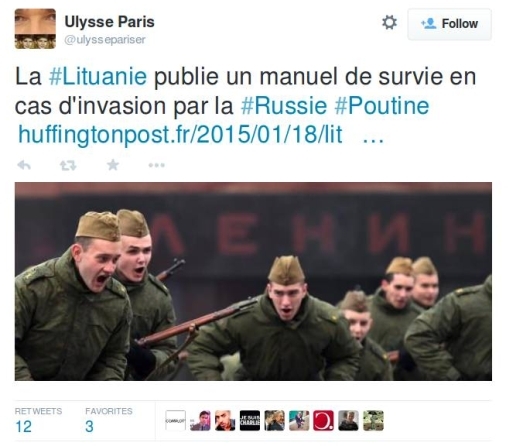 In the event of invasion, the manual says Lithuanians should organise themselves through Twitter and Facebook and attempt cyber attacks against the enemy. Mark Zuckerberg as future insurgent hero – who knew?